Performance is a team game. Best by design, everyone taking it into consideration. Overruling decisions just to improve performance is disastrous for any team. I asked on Twitter if people care about performance and why. Mike Rogers wants websites to scroll without lag and to load quickly. He prefers when things are simple. @shanehudson If a website is hard to use on a £2k laptop with fibre, what chance does anyone else have? Tom mentioned specifically about poorer countries, but both Mikes replies showed that even on our extremely fast and expensive technology, we all still struggle to use the web at times. A large amount of people pay for data PAYG or have small 500mb data packages. 63% of people use the same amount of data as their allowance. I believe the majority of those usage will be driven by allowance, not their allowance set perfectly based on usage. But if the majority of people on a monthly contract are hitting their limit then it is down to us to ensure we don’t waste it. It ruins first impressions. Also cache can break, of course use it but never rely on it. This is the main fundamental principle of performance on the web. Bottleneck has been legacy code. Often we deprecate features or rework pages without completely removing old code or assets. Currently working on the NHS 111 project - works same as phone - answer questions about symptom and get directed to services that can help (callback, visit or phone them). •Hierarchy	•One context	•Really simple, one image	•Call to action What makes this page fast? @shanehudson • Hierarchy • One context • Really simple, one image • Call to action What makes this page fast? 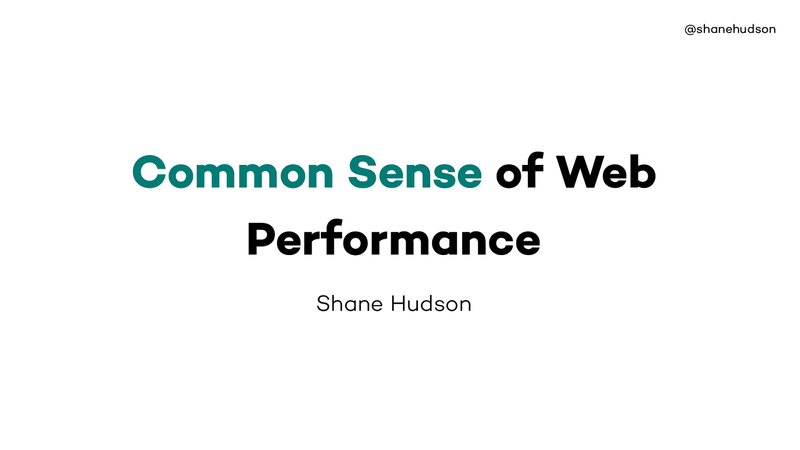 @shanehudson What makes the website fast? What makes the website overall fast? Saw Joe give a talk in Bristol, he said some interesting things about cognitive load. The disposition pages have a lot more information, all of which is important. There is a clear difference in how easy people find those two pages to use. It works okay because it is the last page in the journey and importance is in order. But if pages like this were used earlier, then it would really slow down how quickly the user could progress •Six different contexts	•Map	•Service lookup (backend)	•Call to action is not obvious, ordered by recommended priority What makes this page slower? @shanehudson • Six different contexts • Map • Service lookup (backend) • Call to action is not obvious, ordered by recommended priority What makes this page slower? The map is one of the heaviest parts of the site, we decided that it gives a lot of benefits for letting the users see which services are nearest. So we made sure it loads async, goes back to the point about making web slower then fixing it. On some websites we are in control of everything, but usually that’s not the case. Most websites have a CMS controlling the content, and can easily end up with pages full of unoptimised images etc. The other type of requirement tends to be stakeholders, business reasons etc. Causes each page to be slightly slower. But the privacy is worth the slight performance hit. @shanehudson Can a website be too fast? @shanehudson Wait, did something happen? Too fast. It is possible to make websites load so quickly that the user doesn’t notice they have changed. We improved and removed the blue, but the site was so much quicker the text (and at one point logo) didn’t load quick enough. Felt worse even though a second faster. View Common Sense of Web Performance on Notist.